No doubt rolling is part of the mystique of kayaking. What other small craft can be righted after a capsize, with the mariner still in the boat! But is it really necessary to learn how to roll? The debate remains polarized. A beginner will hear everything from "If you can't roll, you shouldn't be out there" to "Even a bombproof roll will only bring you right back up into the situation that caused you to capsize, so you are likely to flip over again". Learning to roll is a matter of personal choice. There are many paddlers with years of safe paddling experiences, who do not know how to roll, and are not about to begin, thank you very much. This is a valid position and needs to be respected. I suspect the vast majority of sea kayakers fall into this category. I believe there is a fork in the learning path of all kayakers - one path leads to a roll, one path does not. The important thing is to make an informed decision about which path to pursue. If you're going to learn to roll, make sure you're doing it for the right reasons. First, let's look at the likelihood of a capsize. Prudent paddlers try to avoid capsizing. Let's face it, you get all wet and cold - it's no fun! In over 30 years of paddling, I have never tipped over by accident while touring, except in surf, and once while playing in a tidal rapid. Many paddlers would say the same. It's so much easier and safer to prevent capsizes than to deal with their consequences. The most common capsizes occur right at the water's edge, while getting into or out of the kayak. Learning to hold the paddle right behind the cockpit while resting the other end on shore as a stabilizer can help to prevent this common problem. Most other capsizes occur by fluke in flat calm conditions, often while someone is horsing around, fussing with gear, or trying to take a picture. But as paddlers begin to push their learning curve in challenging conditions, there is more potential for a swim in the ocean - eddy lines in currents can catch paddlers unawares and flip them. Launching, landing, or playing in surf are the most likely times to go over. Second, let's look at the consequences of a capsize. Flipping in warm water is no big deal - unless there are sharks around! You just hop back in and carry on. But in cold water, a capsize is the beginning of a chain of events leading to hypothermia if you are unable to get your body back out of the water. This is why practising rescues is so important for cold water paddlers. In terms of a self rescue, I think the roll is a fairly unrealistic response to many capsizes - if you're tipping over by fluke in flatwater conditions, you probably aren't gripping the kayak tightly enough with your knees to stay in and roll back up. If you're tipping over because you're paddling in wind and waves beyond your abilities, you are quite likely to be too freaked out to stay in the boat and roll, and even if you do, you're right back in the same situation. If you are capsizing due to a lack of judgement or understanding of ocean conditions, then you might be better off investing your time learning to understand the weather, the ocean, and how to navigate so as to avoid problems. So, should anyone bother to learn to roll? Well, there are some huge payoffs. Learning to roll dramatically increases your ability to brace with the paddle to avoid capsizing in the first place. Paradoxically, once you learn how to roll, you likely will not tip over very often. A roll is simply a high brace done from underwater. So if you know you can brace from underwater, then it becomes easy to brace while sitting upright. Intermediate paddlers who want to push their limits will definitely benefit from learning to roll. You can go out and learn to surf or paddle in currents without a roll, but the problem is, every time you flip over, you have to get out of the boat and swim. This saps your energy very quickly, so you can't play long. Your learning curve will improve rapidly if a capsize is simply a prelude to rolling back up and carrying on. You will flip a lot while learning to surf, and the roll allows this to be fun. There really is no reason not to start working on a roll early on in your paddling career. One thing I can tell you is that it's tricky to learn, but once you get it, the roll is physically very easy to perform. The main challenge is learning to snap your hips to the side, causing the kayak to roll back up, simultaneously relaxing the rest of your muscles while executing this complex manoeuvre from underwater. It takes a lot of practice, and then it's easy--physically. Psychologically, it can take years to develop the mindset needed for a truly bombproof roll. It's important to have clear goals when learning to roll. Be realistic about what you hope to achieve. Take the roll in steps. Work at your own pace. It's far more important to finesse your hip flick than to worry about the intricacies of paddle placement. Nothing breeds success like success - always end a session on a positive note, even if that's simply performing a hip flick along the edge of the pool. Hopefully you will have someone coaching you who is skilled, patient and supportive. Taking that step into the third dimension of kayaking can be a whole lot of fun, will build your skills, and just might come in handy some day. Dan Lewis of Rainforest Kayak in Tofino explains the pros and cons of learning to roll your kayak. 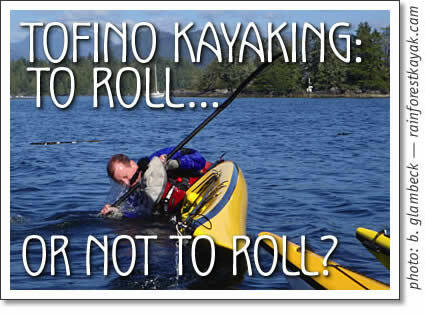 To Roll or not to Roll is from a series of Tofino kayaking tips in Tofino Time Magazine.